Ranbir Kapoor’s recent offering Ae Dil Hai Mushkil is heading very smoothly on box office and getting overwhelmed response from audience. Being one of the much hyped and awaited movies of the year, it has been released with immense buzz among fans and as expected received favorable reviews from critics as well as moviegoers. As always Ranbir has given marvelous performance in Ae Dil Hai Mushkil. His chemistry with Anushka Sharma is being liked by everyone. Because of brilliant acting and youthful music, the movie has marked as the complete entertaining package by viewers. Karan Johar has also received huge appreciation for his direction from critics. 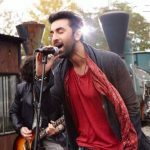 Despite Diwali pooja and adjacent mammoth Shivaay, Ranbir-Anushka-Aishwarya starrer Ae Dil Hai Mushkil had registered sixth highest opening of the year so far and did the excellent business of 35.60 crores in the opening weekend from Indian screens, which included 13.30 crores of Friday, 13.10 crores of Saturday and 9.20 crores of Sunday. Now the movie is running in weekdays but being holidays, it had reported impressive business in last 2 days. On Monday, it witnessed almost 92% of growth than Sunday and raked the business of 17.75 crores. Then on Tuesday also Ae Dil Hai Mushkil remained strong and minted the amount of 13.03 crores. After 5 days, total collection of the movie was recorded as 66.38 crores on domestic box office and 46.67 crores from international market. On the next day i.e. Wednesday, being normal working day Ae Dil Hai Mushkil has witnessed usual drop of 42% in its business and added the amount of 7.63 crores to its account. With this, its 6 days domestic total has become 74.01 crores and surpassed the lifetime total of Dishoom (69.99 crores) & Kapoor & Sons (73.25 crores).